The Southeast Asian island city-state of Singapore is one of Asia's, if not the world's, most modern cities, with a population of 5.5 million. It is also a major Asian financial hub, with a stock market worth $473 billion. On the surface, Singapore may seem like a bad investment. Slow economic growth, deflation and a falling stock market are making headlines. But by two important measures, Singapore is looking like a good place to invest. (We recently wrote a detailed free report on the prospects of the Singapore stock market... click here to download your copy). Economic growth was stagnant at 1.8% for the first three months of 2016. Prices have been falling for 17 months in a row, so deflation is a serious issue. Global trade is slowing, the real estate market is falling and the growth trajectory of China (Singapore's largest import and export market) is a source of major uncertainty. The Singaporean stock market has not been breaking any records, either. Singapore's Straits Times Index, or STI, has dropped 2% so far in 2016. It's down 28% over the last three years and 23% over the past year (all returns in U.S. dollars). 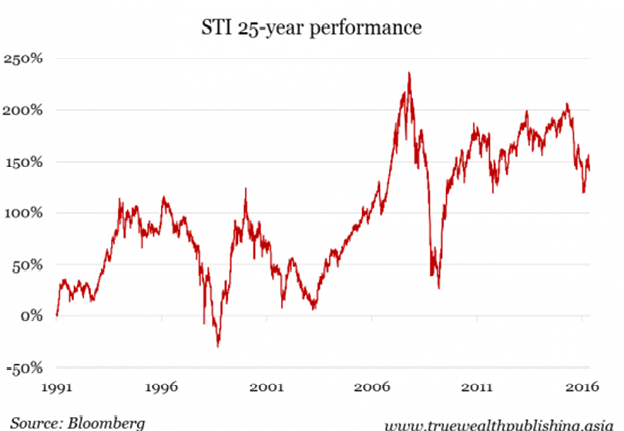 The STI has only averaged a 3.5% return each year for the last 25 years. Of course, that's the average. The market can have huge swings. For example, in 2009 the STI gained 68%. But it lost 49% in 2008. But in spite of the negatives, now may be a good time to invest in the Singapore stock market, for two reasons. First, the dividend yield for Singapore's stock market is one of the highest it's ever been. The market's dividend yield is currently about 3.5%. That is higher than the historical average of 2.7%. In fact, it's the third highest it's been in 30 years. Why does this matter? 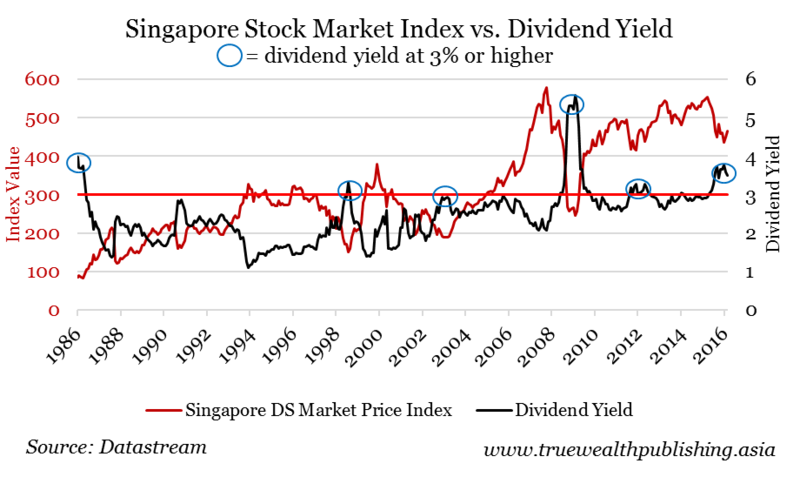 Because every time the dividend yield for the Singaporean stock market has been above 3%, the market has on average risen 100% or more over the following 17 months. See the chart below, where the solid horizontal red line represents the 3% mark for dividend yield. Second, the cyclically adjusted price-earnings ratio (CAPE ratio) suggests the Singapore stock market is cheap right now. The CAPE is similar to the P/E, except the CAPE adjusts for inflation and for booms and busts in market cycles. To calculate the CAPE, take all the annual earnings per share for an entire index for the past 10 years (the length of the average business cycle) and adjust for inflation. Then, divide the current value of the market index by the 10-year average inflation-adjusted earnings per share for the index. This gives the CAPE ratio. 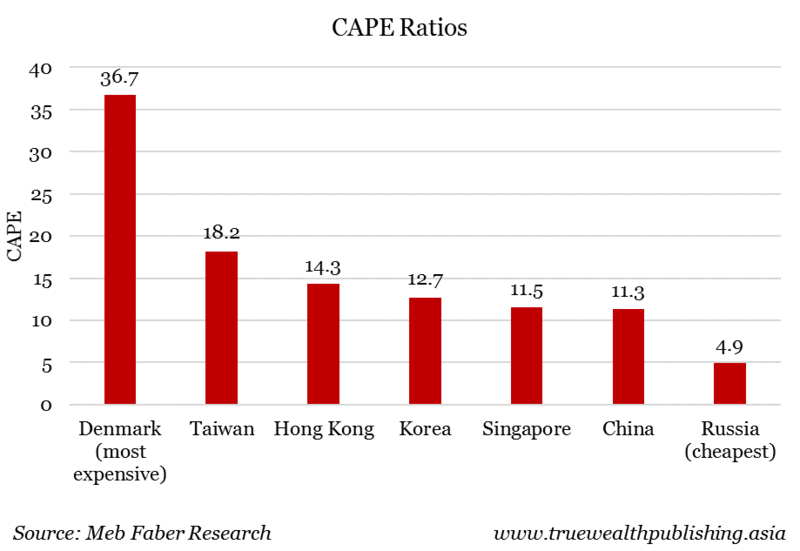 Singapore's CAPE ratio as of March 2016 is 11.5, making it one of the cheapest markets in the world. It is the fifth-cheapest developed market after Spain, Portugal, Norway and Italy. It's cheaper than many of its neighbors, including Korea (12.7), Hong Kong (14.3) and Taiwan (18.2). Singapore's shares have only slightly higher CAPE ratios than China's (11.3). The CAPE gives information about long-term value. It doesn't say anything about when shares will increase in value, and certainly does not suggest a sudden spike in the short term. But if you have a long-term perspective in mind, then a low CAPE means good value. Markets with low CAPE values tend to perform very well over time. According to the current dividend yield and the CAPE ratio, Singapore's market is looking cheap and will likely grow in the long term. To invest in Singapore, look at an ETF that tracks Singapore's Straits Times Index (STI). For investors trading on the New York Stock Exchange, use the iShares MSCI Singapore Index Fund (EWS - Get Report) . And for more details on the prospects of the Singapore stock market, click here to download our free special report. Kim Iskyan is the founder of Truewealth Publishing, an independent investment research company based in Singapore. Click here to sign up to receive the Truewealth Asian Investment Daily in your inbox every day, for free.